I’m actually sad writing the review because I genuinely love YSL’s products and this was an exciting launch from the brand and the though behind it was also great. I’m the kind of girl who likes to have some cohesiveness to her make up, especially lips and cheeks. I really wanted to like this one, but after 5 failed attempts, I give up. This one is just not for me. Now, let’s dive deeper into this mystery. After watching several videos on application, I chose to stick to fingers to blend this on my skin as well as lips. Which was fine, but the texture is too funny. It is reminiscent of the silicon-y primers I usually despise, and that on my lips is excessively drying. Secondly, the colour was way off for my skin. I was at the Debenhams make-up counter while looking at these and the Rep there suggested me to try saying it will compliment to my skin-tone. I usually never-ever listen to Reps in stores but it was one of those days, and I really wish I hadn’t in this case. The colour is very cool-tone which is fine, but it is not pigmented enough. I have a similar colour in my stash – Illamasqua Cream Pigment in Androgen ($28.39) that has the intensity of colour, looks like a dream on my cheeks and lips and is not drying at all. FYI, dupe alert, if you’re really fond of this shade from YSL, I’d still recommend opting Illamasqua as it is a lot of product for your penny and is definitely a more pigmented purchase. 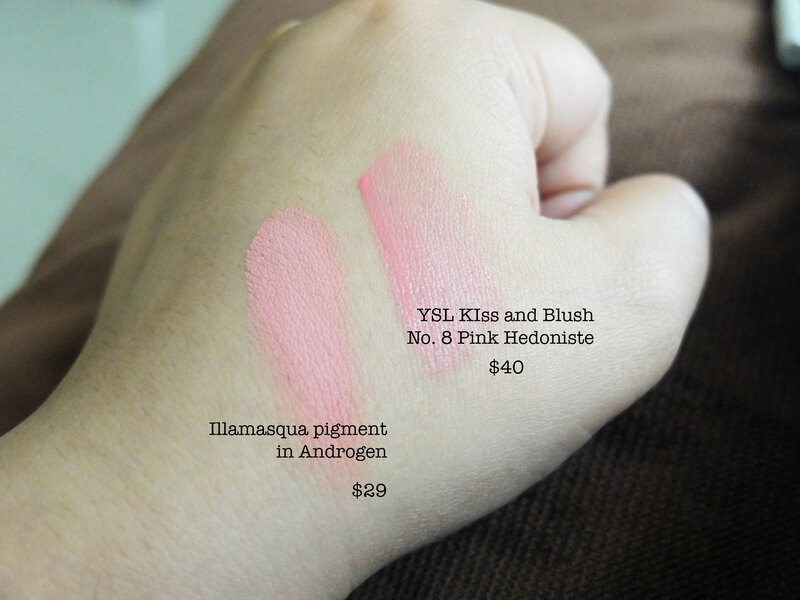 Also, it is cheaper from YSL Lip and Cheek stains which is $40 each. Lastly, It makes my lips look like crap (and cracked). It seeps into every nook and corner to make your lip look dry and blotchy. On cheeks, it’s a whole other story. They blend and stay on for 6 hrs (max). It does require quite a lot of layering, but definitely works. I will use up the entire thing for lips or might pop it over to a girlfriend who has amazing lips. I’m really sorry YSL, I love everything except this from your line so far. What do you guys think? Good purchase or not? I was planning on buying one of the YSL Kiss and Blushes but your post made me a bit sceptical. I really like the corally and pink shades but I’m definitely going to go into the shop and actually try them on my face. I hate when lip products accentuate the lines on my lips! Ohh yes, Please do try it on. Or, do look into their original glossy stains, they were amazing.